Or, Smiting Pagans With the Power of EXODUS! I've been holed up in my apartment for roughly a week now, sick as a dog, so I decided to dust off the old NES emulator, and write a review. 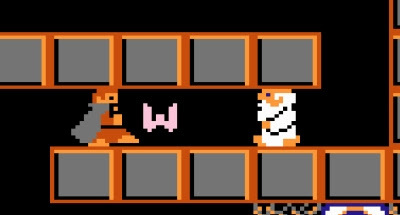 However, I'm just not up to discovering another lost gem like The 3-D Adventures of World Runner or the face-meltingly odd 8-Eyes. 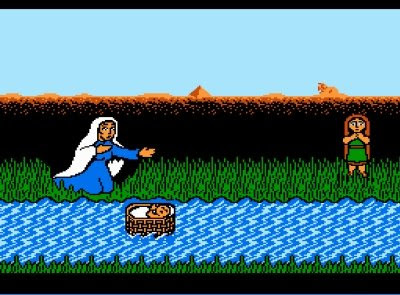 I'm sticking with one of my own personal favorite games from "back in the day," a classic of non-licensed, religious-themed, oddity. I first discovered this classic when I was in High School, at The Good News Bookstore in Mt. Pleasant, SC. This blessed place was a combination Fundamentalist Christian bookstore, deli, music store, and toy store that I used to refer to as "The Christian Chuck E. Cheese." The 17-year-old obnoxious punk version of Wolter used to come there after school with his obnoxious punk friends to play this classic of the genre on an NES they had set up in the back. Why? 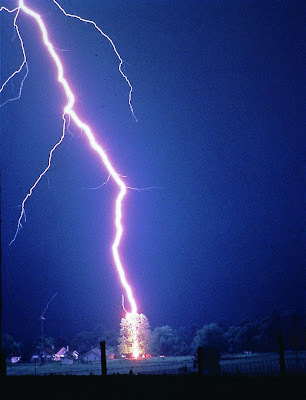 SMITING PAGANS WITH THE POWER OF THE LORD! 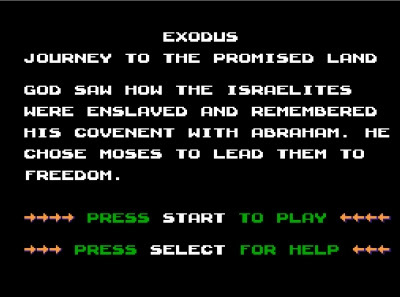 Oh sure, once I read the instructions (when I caved a bought a copy in college), I discovered that you are ostensibly using the "Word of God" (it's shaped like a W, but it's a lighting bolt, people. Trust me on this) to "convert" them. But when they are converted, they explode and disappear. Sounds like a smiting to me, chief. 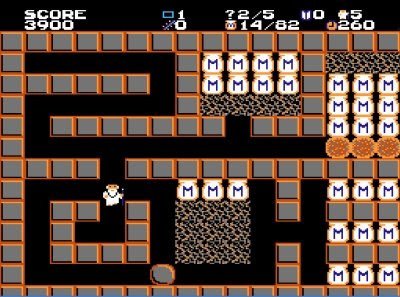 Gameplay: Okay, this game is a lot like some sort of weird allegorical Dig Dug. You're Moses, and you shoot little W-shaped bolts out of your staff (the "Word of God") these in turn help you dig tunnels through "The Murmuring of the Israelites" and "convert" assorted Egyptian soldiers, magicians, and etc. (as mentioned above). You can also "convert" the pagans by pushing boulders on their heads. While moving through the level, you collect "manna" jars, bibles, and "questions" while looking for the door to the next level. 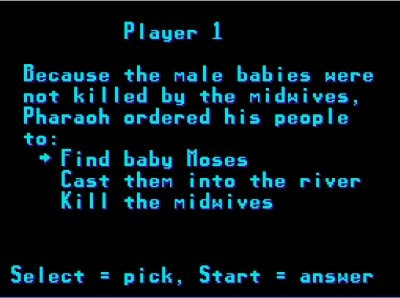 At the end of each level are 5 questions from the Bible. 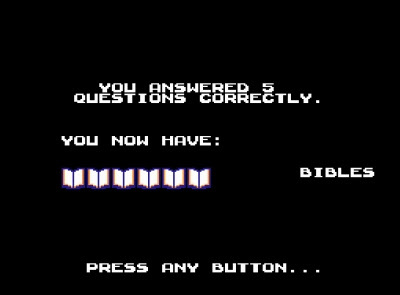 You get a bible for answering each question correctly. Every 7 bibles gets you an extra Moses. Oh, and when Moses dies (usually from failing to avoid the unclean touch of a pagan), he puts his hands over his eyes in a truly adorable fashion. Time Spent Playing As An Adult Before Quitting in Annoyance: Hell, I'm only annoyed that I had to quit long enough to write this review. I need to get back and SMITE PAGANS WITH THE POWER OF THE LORD. Composite Grade: Sound issues aside, I give this one five bibles out of a possible five. Because I'm pretty sure I have literally every track the Misfits recorded.